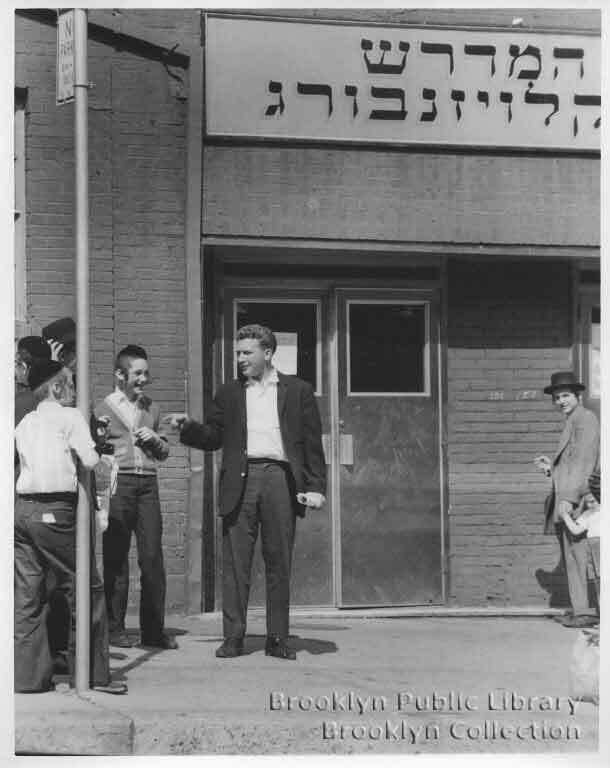 The Klausenburg Synagogue at 131 Lee Avenue, Beth Baruch, used to be a small movie theater that had just one screen and 550 seats. Because there was only one movie showing at a time and it seems, from accounts of those who went, that it was a small, intimate environment. It was active from about the late 1920s to 1950. It was first named the Lee Theater and then became Models Theater. 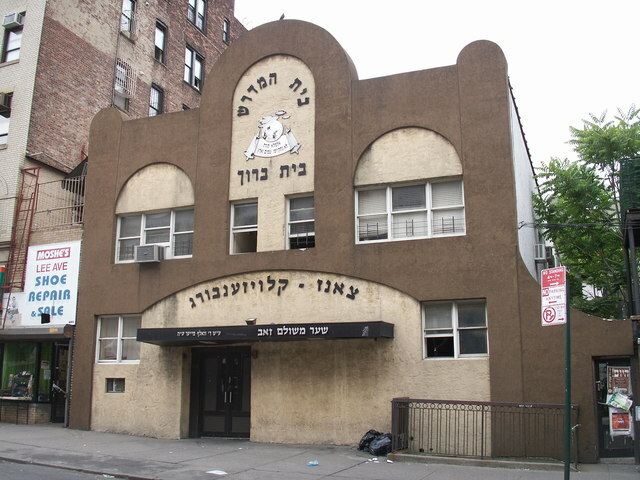 The first mention of this building is in the 1921 zoning record in the Bulletin of the Board of Standards and Appeals of the City of New York. The architects Gronenberg & Leuchtag asked for a permit to erect a two story, 39×132 feet “motion picture theatre” on the east side of Lee Avenue and North of Hewes Street. This leads us to where the Klausenburg synagogue is today. It was the Lee Theater for a while and this is a little confusing because there was a large Lee Avenue Theater elsewhere earlier, which I’ll write about in part 2. It seems the Congress Club was also located there in the early 1920s but I am not sure what that was all about. Maybe offices. 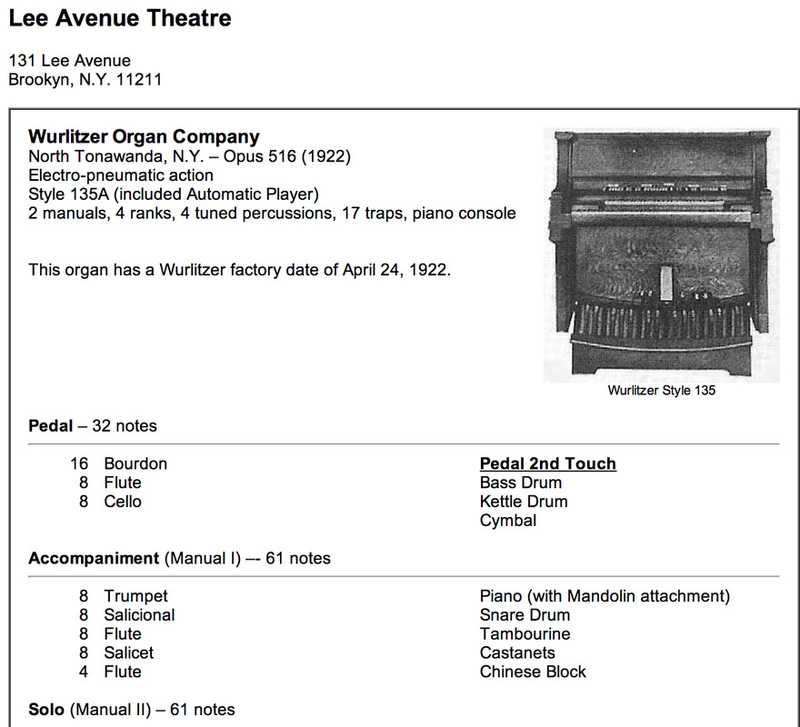 In 1922 the organ for music was installed. In 1926 the manager of the theater made it into the Brooklyn Eagle newspaper when he was held on $500 bail for appropriating receipts, which he claimed to have done so he could pay the doctor’s bills for his sick wife. 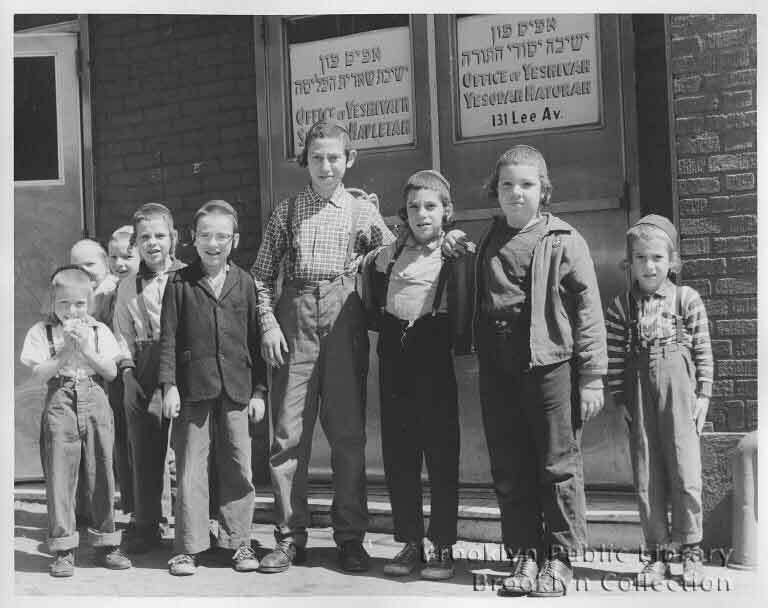 Then in 1946 the theater was again in the news because it lost its license to admit children because of fire hazards. 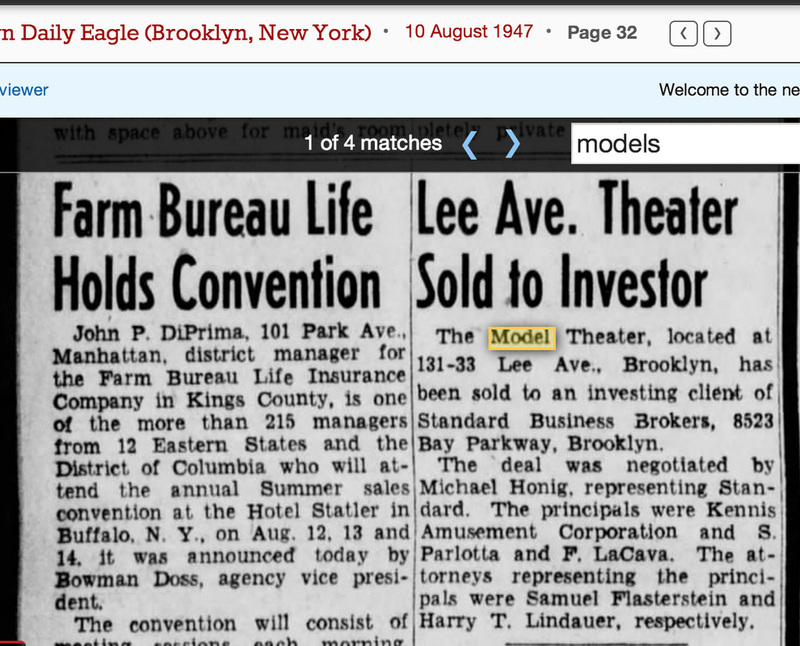 By this time, you can already see that the same theater, located at 131 Lee Avenue, was called Models Theater. 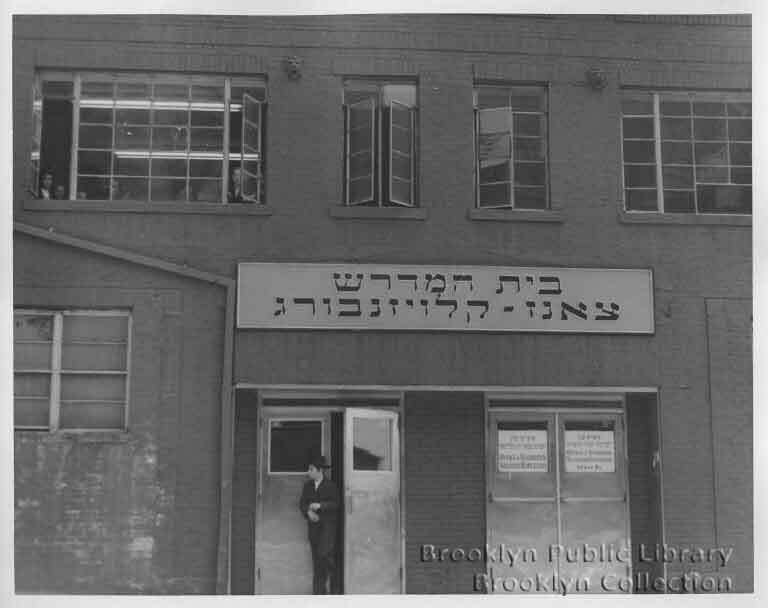 The August 10, 1947 Brooklyn Eagle announced the sale of the theater to an investor. 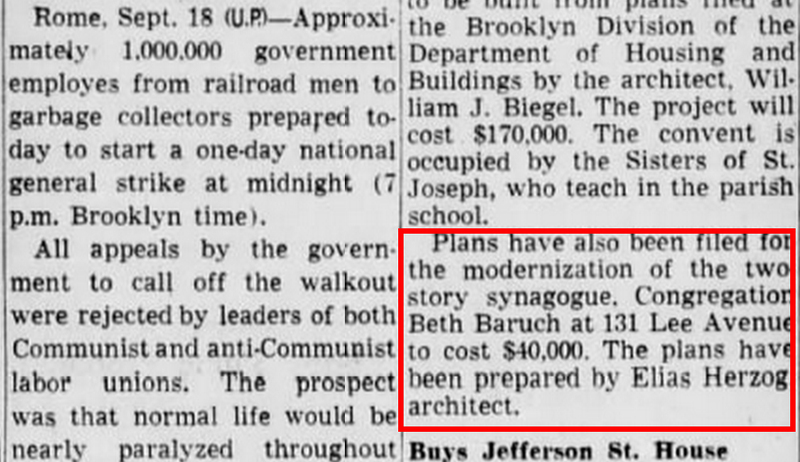 By September 18, 1951 we see that 131 Lee Avenue is already a two story synagogue, Congregation Beth Baruch. The Klausenburg sect invested $40K in renovations. Sadly, I still haven’t found a picture of the theater while it was in use, but you can see from these Herzberg pictures that the theater looked quite different. It had two doors instead of one, it had an all brick exterior and it didn’t have the little hood it has now. Inside, the building was completely renovated, but the synagogue room still shows some signs of its previous use. The two walls to the left and right of the entrance narrow towards the Torah ark where presumably the screen was, so the synagogue is not square. There are doors at either side near the stage. The entire Torah ark wall is decorated with marble, woodwork and embroidery and is framed by corinthian columns. I don’t know if the columns are new. The ceiling has some intricate off-white wood design all over it. There are florescent lights running all around the synagogue, where the wall and ceiling meet. But except for the stairs up to the women’s balcony, everything looks polished and beautiful. Dead Eyes or Cultural Blindness?